The allied conference at Casablanca made the greatest impression on all thinking men in the Axis countries. Our enemies made “unconditional surrender” their declared war aim. Now we knew where we were. I absolutely refused to consider the possibility of anything but a German victory. Both as men and soldiers, we had no other alternative. This article will examine some of Skorzeny’s special missions and his good fortune in surviving World War II and its aftermath. Left: Otto Skorzeny. Right: With the liberated Mussolini 12 September 1943. Image sources: Bundesarchiv, Bild 101III-Alber-183-25 / Alber, Kurt / CC-BY-SA 3.0, CC BY-SA 3.0 de. Bundesarchiv, Bild 101I-567-1503C-15 / Toni Schneiders / CC-BY-SA 3.0. Skorzeny was ordered on July 26, 1943 to fly to Adolf Hitler’s headquarters. After interviewing Skorzeny and five other officers, Hitler said, “The other gentlemen may go. I want you to stay, Captain Skorzeny.” Hitler proceeded to tell Skorzeny that he had been selected to head a top secret mission to rescue Benito Mussolini from Allied captivity. Skorzeny first had to locate Mussolini. After several days of frustration, Skorzeny learned that Mussolini had been taken from the island of Ponza to the port of Spezia and from there to the island of Sardinia. After finding Mussolini at Sardinia, Skorzeny devised a plan to rescue Mussolini. However, Mussolini was flown off of Sardinia before Skorzeny could begin his rescue operation. Skorzeny’s handful of Intelligence people determined that Mussolini was held in a mountain hotel in the Campo Imperatore and was guarded by an Italian military unit. Aerial photographs of the hotel showed that a little triangular-shaped meadow was located just behind the hotel. Skorzeny realized that a dangerous glider landing on that meadow was the only possibility of rescuing Mussolini. Skorzeny used 12 gliders carrying 108 men for the rescue operation. Upon discovering that the triangular meadow was a steep hillside, Skorzeny decided to crash land the gliders and was able to land within 15 meters of the hotel. The surprised and shocked sentry all complied with Skorzeny’s order to raise their hands up and surrender. Skorzeny was able to locate Mussolini without firing a shot. Not more than three or four minutes had passed before Mussolini was safely in German hands. It was clear to me that soldier’s luck had been on our side and made no small contribution—particularly today. How easily things could have gone differently! When I thought of all our fortunate escapes I could only feel intensely grateful to all my comrades who had volunteered to join me. But without their iron discipline and reckless courage nothing could have been achieved. Hitler gave Skorzeny a written order with broad powers to prevent Hungary’s surrender to the Allies. German police were informed about a meeting between the Admiral’s son, Miklos Horthy, and Yugoslavian agents on October 10, 1944, but did not intervene. The next conference would be held on October 15, and it was feared that this conference would result in the surrender of Hungary to Allied forces. Skorzeny and German police were determined to prevent the completion of this conference. Hungarian soldiers fired at Skorzeny and other Germans when they attempted to break up the October 15 conference. German reinforcements came to the rescue and allowed German police officers to take away Miklos Horthy and another Hungarian in a truck. Skorzeny followed the truck and saw three companies of Hungarian troops fast approaching the truck. Skorzeny ran toward the officer who seemed to command the Hungarian troops and convinced the officer to halt his troops. This action allowed the Germans to fly Miklos Horthy from Budapest to Vienna. A special news bulletin was later broadcast over the Hungarian radio: “Hungary has concluded a separate peace treaty with Russia!” It was now clear that Germany had to immediately launch counter-measures. A surprise attack was made by Skorzeny and his troops on Castle Hill early in the morning of October 16. Skorzeny convinced the commandant to order an immediate cease fire and surrender the Castle. The Germans had taken over Castle Hill with relatively few casualties on both sides. Germany and Hungary were now still Allies in the war. Skorzeny and Admiral Horthy had the opportunity to talk for more than two hours after the war when they were both prisoners of the Americans at the Palace of Justice in Nuremberg. Admiral Horthy told Skorzeny that his policies had always been friendly toward Germany, but difficulties at the end of the war had grown beyond his control. Skorzeny wrote that their conversation reinforced the old adage that both sides of a story are necessary to get to the truth of the matter. On October 22, 1944, Skorzeny met again with Hitler at the Wolf’s Lair. Hitler congratulated Skorzeny on his fine work and said: “Today I must give you perhaps the most important order of your life. Until now only a few persons know the details of a secret plan in which you will play a key role. In December Germany is going to launch an offensive which will be decisive for the future of our country.” This offensive became known as the Ardennes offensive or the Battle of the Bulge. Gen. Alfred Jodl ordered Skorzeny to draw up a list of the personnel and materiel necessary for the mission. After he gave Jodl this information, Skorzeny had serious trouble obtaining the necessary men and equipment for the operation. Skorzeny was unable to obtain enough Germans fluent in the English language, and the required tanks, trucks, rifles, and American clothing were not available in sufficient quantities. Skorzeny was convinced the mission was in serious trouble. The vital element of secrecy was also compromised by dozens of wild rumors circulating about the mission. After some deliberation with another officer, Skorzeny decided to let all the rumors circulate freely while he pretended to try to suppress them. He even went a step further and launched some additional false rumors. Skorzeny’s reasoning was that Allied intelligence would become confused by the maze of differing reports which reached them. One rumor that circulated was that Skorzeny’s unit would march to Paris with the intent of capturing the Allied Supreme Headquarters. This rumor reached Gen. Eisenhower’s headquarters and caused the Allies to take extreme countermeasures. Eisenhower moved his quarters into a simple house where he was guarded by a large number of soldiers; these cordons extended far into the surrounding area. Eisenhower was virtually a prisoner in his own headquarters. The Americans also frantically searched for Skorzeny in France until the first days of February 1945. Skorzeny wrote that an intolerable lack of supplies existed during the Battle of the Bulge. He was badly wounded over one eye during the fighting. Hitler sent Skorzeny to his personal doctor, Dr. Stumpfegger, who bathed his wound in a strong infrared light and gave Skorzeny a number of injections to counteract the infection. Skorzeny’s wound healed perfectly, and Hitler gave Skorzeny a new assignment on the Eastern Front. Their futile attacks sickened us; their dead lay in mounds and were used as cover by the attacking troops. Our constant fire always brought their advance to a standstill. I was with [SS-Obersturmführer] Scheufele in his bunker for hours and constantly observed this sector. We were relieved to be able to stop their assaults but the sight of the enemy dead was most disturbing. The Russians never attempted to retrieve their wounded; it was every man for himself. Their only salvation was to crawl away if they had been hit. The courage they displayed time and again, even in hopeless situations, was typical of future encounters. Skorzeny was gratified that some of his old comrades from Mussolini’s rescue mission joined him on his new assignment. Their old battle cry, “No sweat,” was on everybody’s lips. Skorzeny’s position as a division commander on the Eastern Front brought with it a multitude of new responsibilities. He had to care not only for his soldiers, but also for the civilians living in the division’s area. Adequately supplying the troops continued to be quite difficult. Fortunately, a resourceful supply officer found a huge cache of Model 42 machine guns to supply Skorzeny’s troops. The same supply officer found 12 75mm anti-tank guns from a firm near Soviet troops that had been written off by Berlin. Skorzeny as a divisional commander was constantly on the move overseeing his defensive positions. He had to ensure that his newly established units could hold together well in combat. After numerous engagements with Soviet soldiers, Skorzeny reported that the men of his division were fighting splendidly. Inevitably, quantitatively superior Allied forces resulted in Germany’s defeat. Skorzeny wrote that the thought of escaping to a foreign country, or even of suicide, was tempting. It would have been easy to reach a neutral country in a Junkers Ju 88 plane. However, Skorzeny had nothing to hide from his former enemies and felt he had done nothing wrong. Skorzeny had served his fatherland and done his duty as a soldier; he chose to stay in Germany after the war and face Allied captivity. Skorzeny persuaded the other defendants to accept Durst as their chief defense counsel. The American prosecutor summoned a German captain who accused Skorzeny of distributing poison bullets to his commandos to use against Americans during the Battle of the Bulge. The captain testified that he identified the poison bullets by a red ring around the case. On cross-examination, Durst showed the captain a bullet with a red ring around the case and asked, “Is this the type of bullet you are speaking of?” The captain said “Yes.” It only took Durst a few minutes to get the captain to admit that the bullet in Durst’s hand was a waterproof bullet, and that the poison bullets were entirely different in appearance. The captain confessed he had lied to the court. The American-run court then attempted to convict Skorzeny for ordering his men to wear American uniforms during the Ardennes offensive. Skorzeny testified that he had given his commandos orders not to fight while in American uniforms; that they did not fire a bullet while in the disguise; and that his men had abided by The Hague Convention. Skorzeny also testified that the American and British had followed the same procedure many times. The tribunal was not convinced that military units fighting for the Allies had worn German uniforms. Rumors were not acceptable as evidence in a court of law. The next day would bring the trial to a conclusion since the tribunal had other prisoners to try. Skorzeny had no further defense, and he didn’t sleep that night because he was worried about the trial’s outcome. Skorzeny was surprised the next day when Durst called to the witness stand British Royal Air Force Wing Commander Forrest Yeo-Thomas. Yeo-Thomas testified that the British Secret Service often wore German uniforms, were always armed, and when trapped, used their guns without hesitation. He also explained that German soldiers were sometimes ambushed so that their papers and uniforms could be taken and used by British agents. British Royal Air Force Wing Commander Forrest Yeo-Thomas. Source. As Yeo-Thomas stepped down from the witness chair, Skorzeny and the other defendants stood at attention in a gesture of appreciation. The tribunal had to acquit the German defendants because otherwise they would have to admit that the victors fought under a different set of rules than the losers. Ironically, Skorzeny had won his case even though he had been defended by an American military lawyer before a tribunal composed of American military officers with his primary witness being a British military intelligence officer. Skorzeny declared many years after the war: “I am proud to have served my country and my Führer.” He never apologized for his actions during World War II. In this war, Europe, the real Europe, is fighting against Asia. If Germany fails, the true core of Europe will disappear and so I and my men are prepared to stand at your side to the bitter end and fight on at the gates of Berlin, if need be. The Western Allies, who are now helping to overthrow Germany, will bitterly regret their action. “Open Borders”; an economically unsustainable demographic invasion and occupation without the hot war Stalin had planned to unleash on all of Europe. The following video clip shows the flow of ‘asylum’ seekers to European countries during a mere three years, 2012-2015. The flow began before 2012 and accelerates after 2015. Click here if the short youtube visual below does not appear. The second clip relates to the United States. The Will of The People is yet to be verified by referendum in any Western nation. Germany’s War documents that the Allied leaders of the Soviet Union, Great Britain and the United States were primarily responsible for starting and prolonging World War II-costing million of lives. Far from being the conqueror of Europe, Adolf Hitler saved it from Stalin. The origins, aftermath and atrocities of WWII have all been deliberately mischaracterized. The agenda for the false narrative is becoming clearer by the day for Western nations. Skorzeny, Otto, Skorzeny’s Special Missions: The Memoirs of ‘The Most Dangerous Man in Europe’, London: Greenhill Books, 2006, pp. ix, 26. Luther, Craig W. H. and Taylor, Hugh Page (editors), For Germany: The Otto Skorzeny Memoirs, San Jose, CA: R. James Bender Publishing, 2005, pp. 299, 303. Infield, Glenn B., Skorzeny: Hitler’s Commando, New York: St. Martin’s Press, 1981, pp. 133-135. Luther, Craig W. H. and Taylor, Hugh Page (editors), For Germany: The Otto Skorzeny Memoirs, San Jose, CA: R. James Bender Publishing, 2005, p. 425. Skorzeny, Otto, Skorzeny’s Special Missions: The Memoirs of ‘The Most Dangerous Man in Europe’, London: Greenhill Books, 2006, p. 107. Previous Previous post: California Dreaming: The Hippie ‘Flower-Child’ Revolutionaries Who Protested The Vietnam War & Their Ties To The Military Intelligence Community Driving It. A Cautionary Tale. Well done, John Wear. Its about time GERMANS WERE ALLOWED TO HAVE THEIR GENUINE WAR HEROES just like everybody else. The (fake and thoroughly disproved) holocaust story has resulted in the German people being made to be too ashamed to dare celebrate heroic, courageous exploits of German military men in WWII. In fact even WWI military heroes have had their candles ‘put out’, such as the astonishing achievements against all odds of German Commander of EAST AFRICA Von Lettow-Vorbeck who kept this German colony from falling into (determined) British hands throughout the war – undefeated – thanks to his loyal African askaris’ support and the idea of a ‘bush war’ from the Boers. How many Germans have even heard of him? There are many other heroes of world war 2 who go unsung because victors’ version of history has cast them as ‘traitors’ and ‘sinners’ or just ‘ignored’ them – and not just Germans – such as T E Lawrence (Lawrence of Arabia) – was he murdered?, Vidkun Quisling of Norway, Romanian Corneliu Codreanu, William Joyce and literary giant Knut Hamsun. from which I got my information. Quite an education. All peoples need their heroes to inspire and admire. Is that why the communists everywhere pull down statues of historical heroes as fast as they can, to be replaced with their usual fake history? Skorzeny was an idiot. The section detailing his planning for Mussolini’s rescue is pure fiction. Someone else planned the whole operation, with no help from Otto. The operation went off brilliantly, but then Skorzeny, at the last second, jumped into the already over-loaded Fiesler Storch plane, which held the pilot, Mussolini, and Il Duce’s large amount of baggage, and ordered the pilot to take off. The plane went over the edge of the plateau, headed straight down, descended about a thousand feet, and pulled out just above the tops of the trees on the valley floor. He caused the plane to almost crash so that he could hog all the glory for the rescue. What is your source for saying someone else besides Skorzeny planned Mussolini’s rescue? A book I read several years ago. Could you give me the name and author of the book you read several years ago? I would like to read it. I don’t remember. It might have been about Skorzeny’s work with Odessa in Spain. If you ever remember, please let me know. I attempt to read all relevant books on the subjects I write about. I, too, read a lot. I’ve read extensively about all of the participants in WW1 and WW2; the U.S., Russia, Germany, Italy, and Japan. As an avid reader of biographies, in general, I’ve read biographies of WW2 characters, in particular. Some of these bios were of somewhat obscure characters such as Sepp Dietrich, the SS Panzer commander. I’ve read 4 or 5 books about Reinhard Heydrich, including one devoted entirely to his “assassination.” Did you know that the two Czech morons hopelessly botched the assassination attempt? They didn’t kill him, the first doctor, who operated on him, killed him as a result of medical malpractice. I’ll bet the SS had a great time torturing that croaker to death. 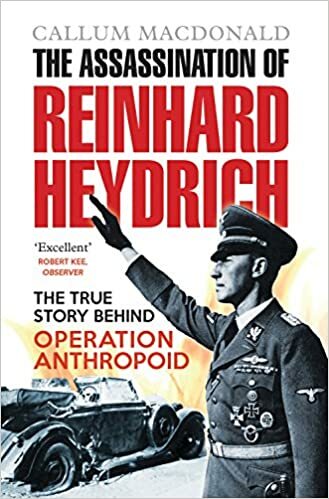 Do you have the name and author of the book where allegedly the first doctor who operated on Reinhard Heydrich “killed him as a result of medical malpractice”? Not so. The source of your unsourced information (?) sounds like sour grapes to me. No individual can be accurately labeled ‘an idiot’ who has commanded and achieved such a legendary rescue as that rescue of Mussolini commanded by Otto Skorzeny – without a single death – and who was awarded by Hitler the Knight’s Cross (for being an idiot? I don’t think so). “You have performed a military feat which will become part of history”. I notice in the photo taken after the rescue Skorzeny stands next to Mussolini central in the photo and the grateful Mussolini is holding Skorzeny’s arm. This is a sign of respect by Mussolini of Skorzeny. The buck stops at the top. If the rescue had been a disaster Skorzeny would have had to ‘cop the flak’ – since it was a daring success Skorzeny must receive the credit without sour grapes. The very first sentence of your post contradicts reality. Utter nonsense. That quote deserves thoughtful consideration, as it says much. Sadly, too many of the (then) future superficial historians are victims of the propaganda sources they rely on and/or are driven by ideology. Of course, it does not help that the text book publishing industry in the US has much Jewish ownership. Tar Baby: I recall some years back reading something to the effect that Heydrich died in hospital because antibiotics (which might have successfully treated his infection) were not yet available. In the US, such drugs were just being developed in the early 1940s. Not sure if penicillin would have been prescribed in his case, but would not have hurt if it had been available. But, the article above is about Skorzeny. elite commandos surprised Italian guards in a daring daytime raid. Hitler presented Skorzeny with the Knight’s Cross for this operation.